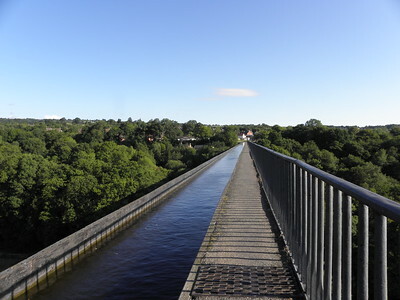 The Pontcysyllte Aqueduct and Canal comprises an 18km stretch of canal including a navigable aqueduct that is considered a masterpiece of enigineering during the Industrial Revolution. It was built by Thomas Telford and William Jessop, and completed in 1805. Innovative metal (cast iron) was used for the trough, while the pillars are made of brick. The aqueduct carries the Llangollen Canal over the valley of the River Dee in north east Wales. This essentially is one single structure, although the UK has included the whole canal and some features around it in the core zone of the nomination. But it's the formidable aquaduct why we all go here, and why it has earned world-wide recognition. I had spotted it from a distance the day before, when crossing the very narrow old stone bridge in the valley on my way to Ironbridge. I arrived at the aqueduct from the side of Trevor. After parking my car, I actually had to look around for a bit to search for the aqueduct: you're so high up here that you not see the arches, but only the canal. I was early, at about 8.30 am, and had the sight completely to myself except for some joggers and curious squirrels. It is good to arrive early, as it gets very busy later in the day when coach loads are offloaded. I walked to the other end via the foot path next to the canal. Fortunately it has a sturdy railing so you do not really feel the height. Just over half of it the wind comes in, shaking you just a little (but enough to realize how tiny you are out on the open on this enormous structure). It is the first aqueduct that I have visited that you can actually walk on, and the narrow canal flowing next to you with no boundaries makes it an extra special experience. After having walked back to the Trevor side, I walked down via the path to look for a photo opportunity of the whole structure from below. The path takes you to a kind of water reservoir, from where you can see some stretches of the aquaduct sticking out above the trees. I spent about an hour at the site, and enjoyed it for its uniqueness among bridge-like structures that I have visited. I would rate it on a same level with Vizcaya Bridge, which also is an explicit technically ingenious construction. March 2018 - Fter visiting Ironbridge we came back to Wales and came closer to Pontcysyllte. Suddenly we were in in Trevor. There was a free car park and due to grey clouds we quickly started or tour to the Aquaduct. Walking over it is quite amazing, and to see the boats on it is very obscure. we walked a little further to see the next lift and then all way back. The historic boats make it an authentic visit. 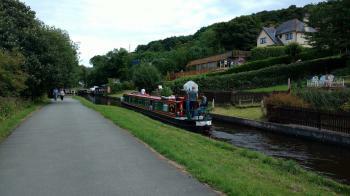 Afterwards we followed the canal by car to Llangollen and made another stop at the wharf. First things first, travelling in Wales made me feel like I was back in elementary school: “Could you repeat that?” was a common reply to me trying my utmost best to pronounce any place name. For the Pontcysyllte Aqueduct I eventually settled on referring to it simply as The Aqueduct. That worked splendidly. Coming from the bus stop I made my way across rather quiet Trevor town. The aqueduct is not directly visible as you are on the upper plateau. So it’s a bit of a surprise when it suddenly gets busy and you get to see the aqueduct standing majestically in the landscape with the Severn flowing way below you. Another surprise was the width of the canal on the aqueduct. I anticipated it to be way wider than it actually was. As a consequence, the barges travelling along the canal are very narrow, albeit quite long, and have a unique look. What they don’t have is much speed. So walking at a bit more than leisurely pace will allow you to overtake most of them. But the views you get from the aqueduct are stunning, so I paused frequently taking yet another picture and having the barges pass me by. The closest train station is Ruabon (Ru-a-bon as I pronounced it was clearly wrong). From there buses run to Trevor (direction Llangollen). Be advised that some buses do not stop in front of the train station in Ruabon, but on the main road. It would be a two minute walk from the main street up to the train station. That is if you don’t miss the proper stop. For me it turned into a 800m sprint. Note: Ruabon Station at the time of writing had no National Rail ticket machine, so you were allowed to buy the ticket on the train. This policy seems to only apply if a station has no ticket office. In Trevor you can do most on foot. If you want you can join a boat tour, but I felt little added value in it. Similar to the Canal du Midi you can also explore the canal system by renting your own boat. It seems rather popular. The landscape is lovely and humming along on your barge must be quite enjoyable. If you walk across the aqueduct, be advised that the path is rather narrow and the aqueduct really high. It requires some caution not to fall into the canal when you pass visitors coming from the other side, especially if bikes are involved. If you are travelling with small children, be mindful of the rails as the gaps are rather large and kids may slip through. After you have crossed, I would recommend hiking a bit further as there are some nice viewpoints a bit further down the canal. Another nice viewpoint is found when you descend down to the Severn river. Last but not least, I must say I felt tempted to just jump in and swim across the aqueduct. I guess I would have been heavily fined, but swimming across a WHS is still on my bucket list. Unless you plan to rent your own boat, I wouldn’t stay here for long. I think two hours are more than enough to explore the site and see the aqueduct from all angles. Nearby Ironbridge Gorge and Gwynedd Castles make better base camps with the latter offering beaches and Snowdonia National Park as extras as well as another bridge by Thomas Telford who built the aqueduct. The Menai Suspension Bridge near Bangor crosses the Menai Straight to Anglesay Island. If you visit Beaumaris Castle, you will pass it. Again, I'm not sure why I have been so fascinated with canals lately, but I went back to the Llangollen Canal WHS on the 4th week of January to see one of the main components of this site, that is the Horseshoe Falls. In order to do so, I decided to stay overnight in the town of Llangollen, which surprised me as soon as my bus from Wrexham entered the town. The whole area around Llangollen constitutes "one huge outdoor adventure playground" with hiking trails, one of which leads to the Horseshoe Falls. I took the trail along the Llangollen Canal and the River Dee to the Falls. 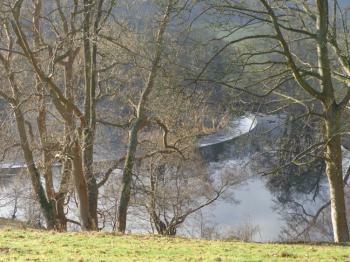 In fact I'd have to say it is the River Dee that makes the natural setting of the whole area so dynamic and beautiful. You can also take a boat on the canal, kayak on the river, or even take a Steam Locomotive (not in winter) between Llangollen and the Horseshoe Falls. At the artificial Horseshoe Falls some water from the River Dee is diverted to feed the Llangollen Canal, the system designed by pioneering engineers William Jessop and Thomas Telford. Later I also hiked up to the hill-top ruin of Castle Dinas Bran, where you get the 360-degree, sweeping view of the whole area all the way to the Pontcysyllte Aqueduct. I am so glad that I went back to the area to see the Falls because, who knows, one day I might choose Llangollen for my nature fix or my recuperation need. I visited this WHS in June 2016. I drove from Ironbridge and I arrived just before the last few boat trips which float through the Pontcysyllte Aqueduct marketed as the river in the sky. The boat trips' highlight is obviously the unique crossing over the aqueduct and the feeling of unease while standing to take pictures at a height of 38 metres (there are no safety railings on one side!). Another worthwhile boat trip experience at the Llangollen canal is the horse drawn boat trip should you have more time in the area. After visiting the Trevor Basin Visitor Centre (open 10am to 4pm), I enjoyed the heritage trail and after a quick photo of the bilingual UNESCO plaque in English and Welsh I drove to the nearby Chirk aqueduct before heading towards Harlech. This WHS reminded me of the Vizcaya Bridge in Spain and both were worthwhile WH visits. I look forward to visiting Forth bridge soon as well as the nearby river Clyde! I visited the Chirk Aqueduct, the Chirk Tunnel, and the Pontcysyllte Aqueduct in May, 2016. I took a train first from Chester (a beautiful city itself) to Chirk (where I had only 45 minutes between trains) to see the aqueduct and the tunnel. Then took a train back to Ruabon (where I had 2 hours between trains) to take a bus to Trevor to see the Pontcysyllte Aqueduct. And then took a bus back to Ruabon and a train back to Chester. 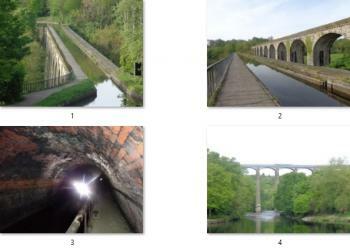 The photo 1 shows the Chirk Aqueduct. The photo 2 show the Chirk Aqueduct for water and ship and the Chirk Viaduct for train. The photo 3 show the Chirk Tunnel, where I came across a boat when I was walking through. The photo 4 shows the Pontcysyllte Aqueduct with 2 boats on it (although difficult to see in the photo). Unfortunately, I didn't have time to visit the Horseshue Falls, where the Llangollen Canal starts off the River Dee. I find it interesting that there are some people who live on the uniquely narrow boats on this canal. I think there are terminology confusions in the "Brief Synthesis" and the "Map" at the UNESCO website. With the Brief Synthesis I believe the canal is called Llangollen Canal and not Pontcysyllte Canal. The bridge by Trevor is called Pontcysyllte Aqueduct. Pont means bridge anyway. The centerpiece of this WHS is the Pontcysyllte Aqueduct. With the Map the other tunnel is called "Whitehurst Tunnel" and not "Whitehouse Tunnel." Because the core zone of this WHS is some first length of the Llangollen Canal, I think the WHS should be called Llangollen Canal, or maybe Llangollen Canal with Pontcysyllte Aqueduct. I went with my grandparents to Pontcysyllte in August 2013, having also visited around six years earlier - before it was inscribed in in 2009. Pontcysyllte Aqueduct and Canal is deemed to be worthy of recognition because it is an early example of the ingenuity of the engineers and architects of the Industrial Revolution. Wales’s hilly terrain does not lend itself to the needs of canals, yet this section traverses the countryside without resorting to locks. Conceived of and overseen by Thomas Telford, construction began in 1795 and was completed 10 years later. The bridge has withstood the test of time, with even the cast iron trough being the original one put in by Telford more than two centuries ago. The mortar is apparently made from lime, water and ox blood! In addition to Pontcysyllte, I went to see the less famous Chirk aqueduct (also part of the inscription). 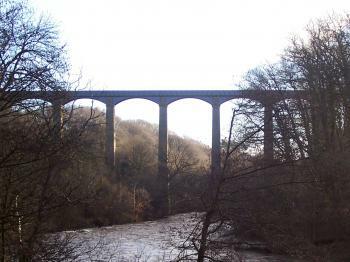 It was completed four years earlier than Pontcysyllte and is now flanked by a railway bridge alongside it. From the aqueduct the canal goes quickly into a tunnel, which provides a clear reminder of just how undulous the terrain is. The landscape, formerly covered in foundries, brickworks and lime kilns, was described in Victorian times as “a vision of hell”. Nowadays that description couldn’t be further from the truth. On the hourly 5A bus from Trevor to Wrexham in Northeastern Wales, I was wondering how UNESCO World Heritage program took me to this corner of United Kingdom to see the unknown aqueduct which I hardy could make a proper pronunciation or even spelling, an engineering masterpiece, the Pontcysyllte. I walked along the Llangolan canal until I reached the aqueduct passing many boats which were mooring waiting for the tourist season to begin in the next couple of months. The aqueduct was indeed impressive especially for it height from the River Dee, its column and ached bridges really remind me the equally impressive of ancient Roman aqueduct of Segovia in Spain. To appreciate the height of the bridge I decided to walk down to the River Dee level, but it was very exhausted when I had to walk back to the aqueduct level again. Then I crossed the Aqueduct, it was a nice design to have walkway on the bridge too, so that I could saw the waterway and the surrounding view. The view along the canal was also lovely but nothing special and some part was similar to another World Heritage Site in Belgium, the old Canal du Centre. I looked around the place together with 5-10 tourists for about 40 minutes and found out nothing I could do more in this place so I hurry walked back to the bus stop to catch the bus back to Wrexham before continue my trip to Conwy for another World heritage Site. For me, it was a fine site as the aqueduct was impressive, the surroundings were also OK, however, since I already saw many industrial sites in England, the birthplace of Industrial Revolution, I started to feel rigidly bored, the place could not evoke any of my enthusiastic, also few information at the site to tell the significant of the place. The berthing boats along the canal looked more interesting for me! I paid the aqueduct a very unplanned visit in January 2008 whilst moving between Dublin and London. An early morning start from London led us to a great winter breakfast at Ironbridge Gorge. A drive further on led me through Llangollen, when suddenly a bell rung in my head that Pontcysyllte Aqueduct was located somewhere nearby. Fortunately a road sign turned up pointing us in the right direction. As such my experience of this site was rather under researched and quick. I pulled up next to the start of the aqueduct to see that some early risers were readying their barges for the trip across it. I strolled out a short way and saw that it was a rather long way down. After this I drove down to Horseshoe falls to get a view of the main span of the aqueduct. Unfortunately as I had a ferry to catch this was as much as I was able to see. The route on to Holyhead (for the Dublin ferry) was fitting as Thomas Telford was instrumental in forging this link between what where then the two main cities of Britain. There are several Telford projects on this route, especially notable are the bridges at Conwy and across the Menai straights, which really add to the understanding of the infrastructure constructed during the industrial revolution. My visit to Pontcysyllte Aqueduct was very brief and I am sure I will head back up there to appreciate it more in the near future. The major works of the Industrial Revolution are a really worthy of addition to the world heritage list, however I feel that combining it with other major works of Telford may really highlight the overall impact of these major engineering works. In order to avoid any potential charges that patriotic pride has outrun objective assessment I don’t normally review sites from UK! But with Pontcysyllte up for nomination this year I will break the rule. In any case it is from Wales, whose “turn” has come round again within the UK “rota” for nomination – rather than from my own country England. This means that most of you non-English speakers will find its name as difficult to pronounce as I do. This is the approximate way to do it apparently - “pont-kuss-uth-tay”. We have been there a few times over the years. 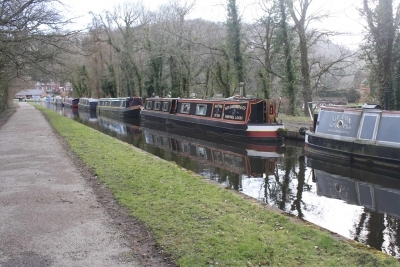 The Llangollen Canal, which is carried 38 metres over the valley of the river Dee by the aqueduct, passes through scenery which, in World or even European terms could best be described as “pleasant” in an understated rural way. If it wasn’t in Wales I would say it was quite “English” in character – indeed the modern “border” is only 5 kms away and the historic boundary of Offa’s Dyke is even less. The Dee still has a fair way to go upstream before it reaches the “real” Welsh mountains – though even these of course strain to reach 3000ft! 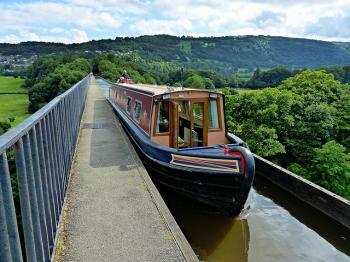 But the spectacular crossing of the aqueduct which is available both by boat and on foot (photo) and the quiet delights of the Vale of Llangollen make this stretch one of the most popular stretches of canal in UK. Interestingly the extension of the canal up to Llangollen was mainly conceived of as a “feeder” to bring water to the main canal from the man-made “Horseshoe Falls” (at c3ft high a potentially grave disappointment to anyone expecting rather more of a waterfall!) rather than for its transportation merits. With the technology of 1805, the valley of the Dee provided a significant engineering challenge for those building a canal to link the Mersey area to the Midlands - so in stepped Thomas Telford with this spectacular cast iron trough perched on sandstone pillars. But this isn’t the first time that UK has nominated a work by Thomas Telford for WH status. He is an early British engineering “hero” and, in 1988, his Menai and Conwy Suspension bridges (both dating to 1826) were proposed. However, the Bureau (it never reached the full WHC) concluded that “While noting the importance of Menai Bridge for the heritage of the United Kingdom, the Bureau felt that it did not meet with the criteria of authenticity set up by the Convention. As far as Conwy Bridge is concerned, the Bureau considered that it would constitute a complement of great interest to Conwy Castle, inscribed in 1986 as one of The Castles and Town Walls of King Edward. The Bureau considered that the authorities of the United Kingdom might perhaps wish to propose an extension of this property, so as to include the suspension bridge.” The logic for these conclusions seems strange. The authenticity issue around the Menai bridge might relate to the fact that in 1893 its wooden deck and in 1938 its wrought iron suspension cables were each changed to steel versions (though even "Iron bridge" was given steel road plates - albeit after its inscription). But quite why the 19th century Conwy bridge might suitably be linked in a single inscription to a number of 13th century castles escapes me! I don’t believe that Pontcysyllte presents authenticity issues but whether it is strong enough in OUV by itself is another matter. I have seen reference to work carried out by the local council in 2005 which “concluded that the bid for WH status would be stronger if the whole of the heavily engineered section of canal from its beginning at Horseshoe Falls (at) Llantisilio right through to just east of the Chirk aqueduct were included”. And that is what has been done including another aqueduct together with the “normal range” of engineering features, wharves and cottages. Will that be enough – there are plenty of earlier canal-related sites already inscribed in UK? Despite these inclusions the Pontcysyllte nomination remains primarily a “single item” structure and the sorts of inscribed sites I look to as comparators include the Vizcaya Bridge and the 4 Lifts - if they demonstrate adequate OUV then doesn’t Pontcysyllte? The former scores highly as being the “first” such bridge and is regarded as having maintained enough authenticity despite some quite significant changes (Don’t be jealous Menai Bridge!). The latter didn’t claim to be the first of its type (Anderton in UK was) but was scored highly on its “ensemble”. Neither engineering concept exactly “took off” around the world in terms of being widely copied so their “universal value” could be questioned. The Pontcysyllte Aqueduct wasn’t the first with a cast iron trough (Telford had developed a prototype at Longden-on-Tern in 1796 - now unused) but could claim primacy as a working concept although the similar Chirk aqueduct (also within this site) was actually completed first. However its completion in 1805 was at the very end of the canal building era. Telford himself spent most of his efforts on road building (he was however involved with the Avon aqueduct in Scotland), and the railway age was only 20 years away. The use of Cast iron for bridges etc had been demonstrated as early as 1781 at Ironbridge – is Pontcysyllte anything other than a spectacular development of this already inscribed initial “revolution”? 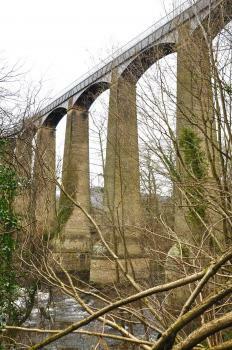 Even the draft Nomination file claims no more than that “Pontcysyllte Aqueduct was part of a sequence of innovations and developments that led to the general acceptance of cast iron and then steel as ubiquitous construction materials and enabled ever greater engineering achievements around the World”. Hmmm…. well the system requires that grand claims be made! My view would be that Pontcysyllte is certainly a spectacular structure which captures the optimistic feeling of the early Industrial Revolution that “anything is possible” and as such is no less worthwhile than the other 2 comparators above. Yet, at the same time, apart from its cast iron frame, has it moved technology that much further forward than the Pont du Gard? I hope it gets inscribed but this does seem to be the era of Transnational Serial Sites and Cultural Landscapes rather than of single structures so it might just not be “big” enough in concept. Iron Structures: "The trough was made from flanged plates of cast iron, bolted together"
Georgian Architecture: Some purpose-built houses for the engineers like Scotch Hall and Wood Bank. Thomas Telford: Designed/Built by him in 1805. Free entrance: You can walk on the aqueduct and along the canal for free.